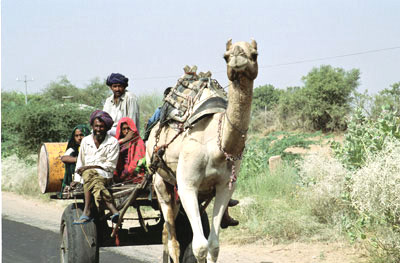 Most of the time on the road in Rajasthan is fairly dead time  it's mostly rural. There are dry fields, and then small towns. A "town" is a row of stalls or concrete sheds along the road (mostly full of car parts), an open-fronted restaurant, and a vegetable market right in the middle of the road. The only time something really interesting goes by is the time when you're not looking. This was our first trip on the road where we weren't dazed from waking up at 3:30 AM, and at this point it was all very new. I pushed the window curtains aside and concentrated carefully so I wouldn't miss a thing. I waved to anyone who was also looking at me, and they waved back. By comparison, the stops were positively exciting  the call of nature was the call of the wild. The first stop was a midmorning break for chai, or tea. We stopped at a roadside stand, and this was probably the largest order for tea they'd had in decades. While they were getting the tea ready we sat on a bench outside. Actually, the bench was more like a cot, with a frame and broad slats  standard issue at places like this. There was a bunch of guys milling around about to get on a farm vehicle, and though we greeted each other, we couldn't talk. English isn't very common outside the tourist areas, and none of us knew any Hindi. They talked to each other and smiled, and they seemed to find our Martian invasion very amusing. In India tea is syrupy  very strong, very sweet and full of milk, and served in small, plastic cups. Mine was near full-boil when I got it, and it took a few seconds to get past the shock before realizing exactly how hot it was. I put it down on a corner of the cot as quickly as I could. Someone gave me a second cup to double mine up, but the damage was done and the lesson already learned. At least the tea was good. I was also happy to see a piece of everyday life. Though my shutter finger was throbbing, I walked up and down the road looking for something to photograph until it was time to go. Lunch, on the other hand, was at a more heavily-touristed road stop. When you have a group in tow, the last thing you want to do is to take them to one of these roadside restaurants with an awning on top  there are too many variables. Here, the menus were in English, and the owner of the restaurant patiently answered the thousands of questions about what this was made of, or whether that was spicy. He was used to handling groups smoothly, and gave the table a speech. He told us that the food was local home cooking, prepared by his family, that it was clean, it was nice food, and furthermore, it was clean. Obviously, he had dealt with the question of hygiene before. I couldn't help feeling a little sorry, even though he didn't feel sorry for himself. Even if the question is on your mind it's not one you should ask. First, it's demeaning to someone who does their job well. But more than that, it doesn't help, because the answer will always be "yes"  especially from the people who don't do their job well. It's always up to you to take a look, and there are plenty of things in packets if you don't like what you see. As it turned out, the meal was fine, and we sampled local breads which were made from millet and corn flour. Besides us, the only other diners were a French couple. The man was wearing a broad-brimmed beige hat, the woman had someone painting henna designs on her hand, and both were smoking up a storm. Rather than go to the curio shop, I walked around the grounds. They had a garden with swans and ducks. Outside the gate there was a large, trough-like tub, with a group of teenaged boys jumping in and out. (These roadside tubs are fairly common, and as anywhere, bathing is one of life's pleasures.) This was one of the better stops. By the second chai stop we were already accustomed. We all ordered sodas, and someone had to get on a motorcycle to go looking for them. There were a some men in turbans and a few young guys, who all seemed to be there for no particular reason. The young guys were very curious, especially since we had some blonde young ladies in the group. One of them positioned himself as if at a party, strategically close to the young ladies, and pretended to be a fly on the wall. He didn't understand a word, but seemed mesmerized nonetheless. The last stops had had limited photo-ops, so rather than drag around a lot of equipment, I left the camera lenses on the bus. Then one of the guys yelled, "Quick! Get the camera!" and it started to dawn on me that I was about to miss The Photo of the Entire Trip. 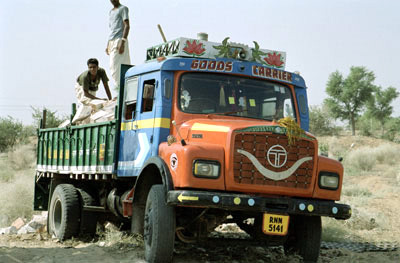 There was a bus loaded with people on top  bright dresses, bright turbans  and they were facing us and waving. We were way back from the road, I had a short lens, and it was utterly hopeless. There's one on every trip, and I kick myself for days when it happens. To explain, Indian buses are packed with people, arms and legs all over the place. Some of them also have seats on the roof, which yields double the seats (and even more if the people on top don't hold on.) The roof was completely full on this bus, and it was an outstanding image. I spent the rest of the trip vigilantly trying to take that photo, but it never came up again. One more reason, I suppose, to go back and see more of India.